It may seem strange to speak this way, but when I saw the photos of the Norcia basilica in ruins, I felt such a sense of loss, grief, and pain that it was as if a friend or a relative had died. It hit me in the gut in the same way. And when I saw how other churches in the town had also crumbled, the effect was only compounded. How oddly reminiscent of that verse about our own mortal bodies: "You are dust, and unto dust you shall return." Churches are earthly images of the heavenly Jerusalem, that is, the Bride of Christ, and they bear upon their facades her face; it is her body their naves imitate, her heart their sanctuaries represent. When a church falls, the Church loses one of her embodiments. These churches were places where I have prayed so many times, on so many visits to the monks and the monastery that is my spiritual home (to the extent that one can be said to have a home here in this vale of tears and land of exile). The basilica is where I fell in love with the traditional Divine Office, where I gloried in the splendor of the Mass of the Roman Rite, where I discerned a calling to become a Benedictine oblate, where I learned best what it means to have roots as a Catholic, worshiping in and above the crypt where, by tradition, Saints Benedict and Scholastica were born. Seeing the huge structure as a pile of rubble brought home to me, perhaps more than anything else has ever done, the transiency, fragility, and mutability of all our human works. The most solid structures we can build are still precarious houses of cards compared to the power of the unmoved Mover latent in the cosmos. It does not occur to me to blame God. He is as He always is: whispering His Word into our ears, our hearts, our sacraments, our churches, infusing His Spirit into the feeble and fallible works of our hands and minds as we strive to serve Him in fear and trembling, in chaste and filial love. "For whom the Lord loveth, he chastiseth; and he scourgeth every son whom he receiveth. Persevere under discipline. God dealeth with you as with his sons" (Heb 12:6-7). It is a long journey from our fallen human condition to the day of our perfect configuration to the only-begotten Son of God, and there is no telling what kind of sufferings or privations will be visited upon us to make our imitatio Christi more real. But there is a time for words and a time for silence. Now is more of a time for the latter. I will share some photographs that my son Julian and I took of this beloved place. (Any good photos are his work, while the blurry ones are mine.) The noble basilica depicted here now rests in pieces. I hope and pray that someday it will rise up in resurrection. One last photo, to end on a note of hope. 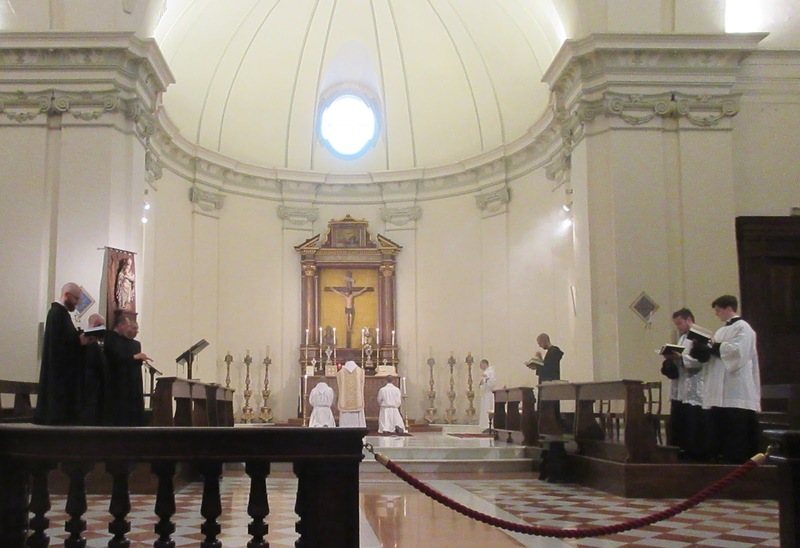 As most readers probably know by now, the monks of Norcia are busy building a new monastic home in the mountains, at a location outside the city that they are calling "San Benedetto in Monte." This site has a former Capuchin church that has undergone rebuilding (and has, it seems, withstood the earthquakes). A few years ago I had the chance to visit it before the scaffolding was erected. Here is a photo of part of the interior. Please consider making a contribution to help the monks rebuild.